The 2018 CE Pro 100 Brand Analysis report shows Salamander is ranked again as #1 as leading AV furniture brand. 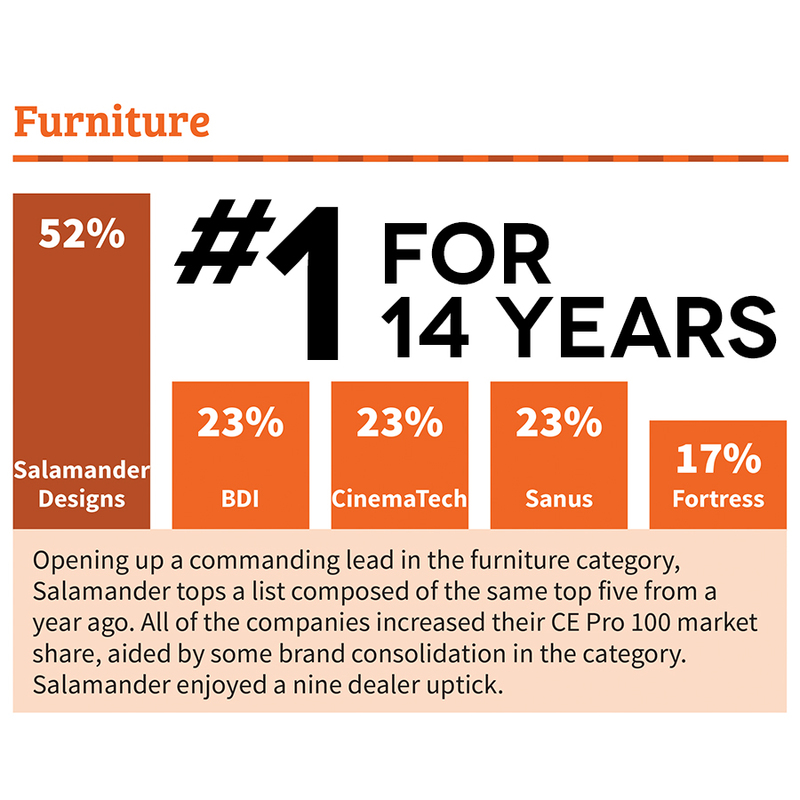 This is the 14th consecutive year Salamander has taken the top furniture position, which has been consistent for us each year since the inception of the CE Pro Annual Brand Analysis. Custom, convenient, elegant and covered by Limited Lifetime Warranty – these are just some of the most desirable features homeowners seek for their daily entertainment and comfort solutions. And Salamander offers them all. As the trusted brand of choice, our cabinets, TV mounts and other furniture solutions are built to last with quality craftsmanship, premium designs and exceptional details. Our furniture can adapt to your needs today and far into the future. In addition to being #1 in the furniture category, Salamander is in the top-rankings in this CE Pro Analysis in the seating category. With seating solutions that fit every interior and room in the home, our wide selection has not gone unnoticed, and this in-depth study reflects just that. Choose from custom individual, modular and theater row seats that all bear our exceptional quality and durability. The numbers associated with each manufacturer reflect the number of CE Pro 100 dealers using that brand. Salamander is ranked with 52% and has more than double the percentage of its closest competitor. These numbers are closely monitored according to CE Pro, “because these are the most successful companies in the industry”. Many professional integrators look to the brands that are being used by these companies as a signal of success. Having been consistently recognized in these categories for furniture and seating, we hope our current and future customers are even more confident that Salamander delivers a best-in-class experience. And, one that is backed by our Limited Lifetime Warranty for many years of enjoyment. We are the AV and entertainment furniture brand that you can trust and depend upon. If you’d like to try our entertainment furniture and seating solutions or speak with a local professional about a customized solution just for you, please visit an authorized dealer or contact us for our recommendation.